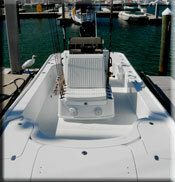 Yellowfin Yachts makes my boats. My 24' bay boats are without a doubt the sexiest beasts on the water. The ride, comfort, versatility and workmanship are unrivaled by any other bay boat in the industry. I have owned 5 Yellowfin Bay boats of various configurations. All powered by Mercury Marine. My latest Yellowfin bay boat (shown above) is my first tower boat and I have to say a hugely welcome addition to my arsenal of well thought out and incredible fishing machines. Its all about advantage when fishing. Getting there first is imnportant, which is why I run Mercury outboards. Being able to see is utmost important. WIth my new Yellowfin bay boat tower I can see fish on the flats coming from twice the distance than if I were on a poling platform of my flats boat. This is a huge advantage when working with my anglers to help them live the dream Fishing In Key West. Seating on my yellowfins is ample and comfortable. Two accross the back, one next to the driver and two up front on the well appointed console seat. Bay boats are not speed demons typically. My custom Yellowfins are all 60 plus mph boats. This makes getting to the fishing grounds fast and easy. 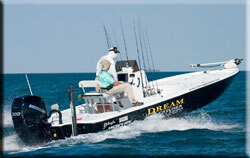 All of my Yellowfin Bay boats are powered by Mercury Marine. Amazingly enough my Yellowfins can get super shallow and chase bonefish into tailing waters. But.. Also ride in a chop out to the reef for some light tackle reef action.